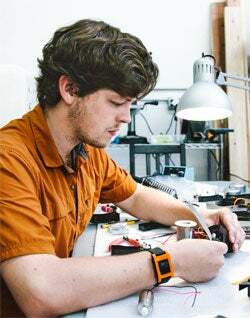 When Kickstarter rejected Lockitron, founders Cameron Robertson and Paul Gerhardt built their own website to crowdfund their phone-enabled door-locking device. After 24 hours, they'd reached their goal of $150,000 in preorders. By the end of their 30-day campaign last November, nearly 15,000 people had reserved a Lockitron, with advance orders totaling almost $2.3 million for the San Francisco-based startup. At least six projects have run Selfstarter campaigns since late last year, Robertson says. Scout is one of them. The home security system, which begins shipping this year, has nabbed more than $300,000 in preorders since February. Bypassing traditional crowdfunding platforms allowed Scout to continue taking preorders beyond its monthlong fundraising window; it also meant not having to fork over a cut of the cash collected. "Selfstarter probably has saved us over $13,000 in fees," says Dan Roberts, Scout's Chicago-based founder. We hoped that it would serve a couple of purposes. One was that if people wanted to use this and run with it, they could. The second was to demonstrate that some of the crowdfunding platforms are flawed when it comes to supporting this kind of product. Kickstarter encountered a lot of problems because products weren't delivering and people wanted their money back. Selfstarter gives you the flexibility to say, "We can take money up front, or we can wait and take money when the product is shipped." It shifts the risk away from the backers and onto the project creators. Selfstarter is a skeletal framework. It's a starting point. It is not a crowdfunding website-in-a-box per se. It doesn't have any capability to send update e-mails to keep backers posted about the project. There is no dashboard where you can easily fix errors that come up or switch people's addresses. It really does need a fair amount of customization and development. We recommend that people think long and hard about why they want to run their own crowdfunding campaign. Is it because they were rejected from a platform, or for some other reason? If the only reason you don't want to go with Kickstarter or Indiegogo is because you have to pay their 5 percent fees, I think you may want to reconsider. The advantage of having a prebuilt platform that's tested--that developers are working on constantly to make sure is running well--is very helpful. But if your team already has a bunch of software developers on it, and you were rejected from Kickstarter, then I think Selfstarter is an interesting route to take.